The Games Workshop magazine, White Dwarf, has seen a lot of changes in its almost 40 year publication history. In February of 2015 the monthly magazine was produced in a weekly format to align with the Games Workshop weekly product release schedule . This change was met with both praise and criticism from readers. Now, after a year and a half of weekly publications, White Dwarf has undergone another change and is back to a monthly magazine. The cover promises a “bigger, better, brand new” format. Let’s see if Games Workshop can deliver. The September 2016 issue of White Dwarf clocks in at 148 glossy full color pages for a $9 cover price. The issue also comes with an Age of Sigmar Khorne Bloodbound Slaughterpriest strapped to the cover. I have no doubt that the chance to get a $30 plastic clampack character for only $9 sold some copies of the magazine. 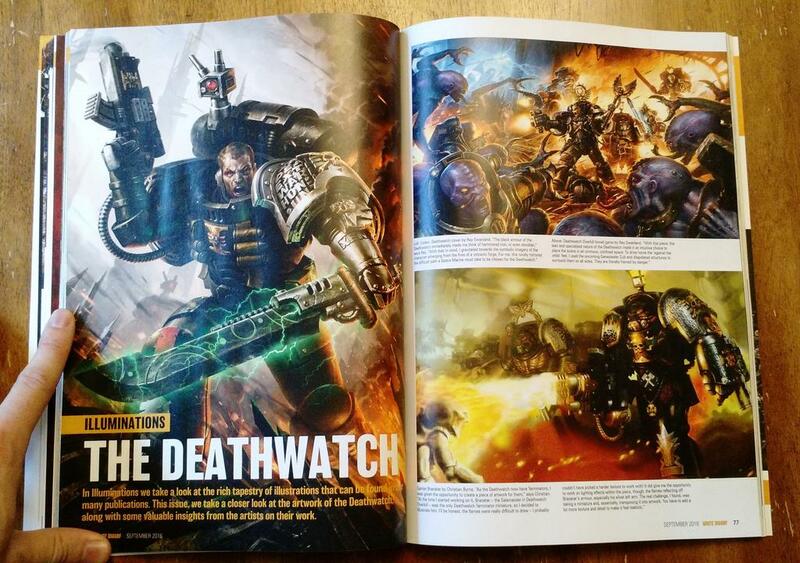 The magazine opens with Planet Warhammer, a 16 page section highlighting “all the latest news about the Games Workshop hobby”. I was thrilled to see third-party digital games getting coverage. 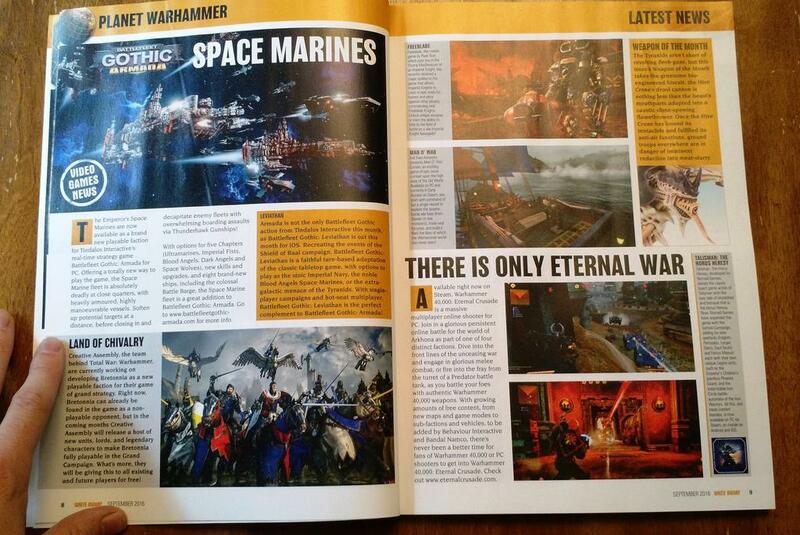 Especially the bit on the upcoming free expansion for Warhammer: Total War, the Bretonnians as a playable faction! These first pages are the most catalog-eque section and includes all the prices, pre-order and release dates for products coming out in September. To my great excitement, A Tale of Four Warlords has been included. This section has been done under many names and in many formats by hobbyists for decades. 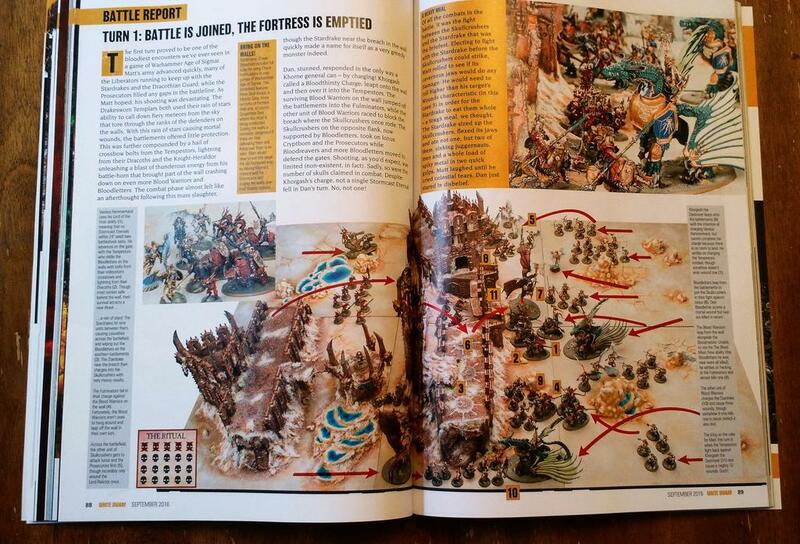 Some of the first issues of White Dwarf I ever owned contained the incredible Path to Glory that followed ever expanding Chaos warbands as players bought, built, painted and played a multiple issue spanning campaign. A Tale of Four Warlords looks to take the tried and true method of getting a group of four gamers to all start an army at the same time and then track their progress. There is a lot of promise for this section and I cannot wait to see what happens next. 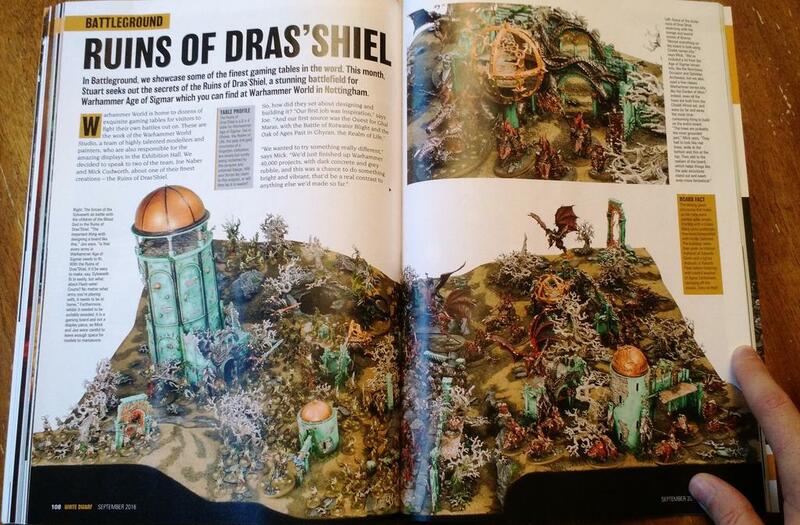 Army of the Month, a White Dwarf staple, brings us an enormous Biel-Tan Eldar army and showcases the entire collection in a massive four-page pullout spread. Army of the Month is ten pages long and not only dives into detail of the army but also includes a full page of Biel-Tan fluff. An interview with the creator, Gavin Beardsmore, runs throughout the section and provides great insight into his collection. Pages 44-69 contain one of the cover stories, Boxed Games Bonanza. As long as I can remember, readers of White Dwarf have always wanted rules to be included in the magazine. Well, there are 25 pages of rules right here. 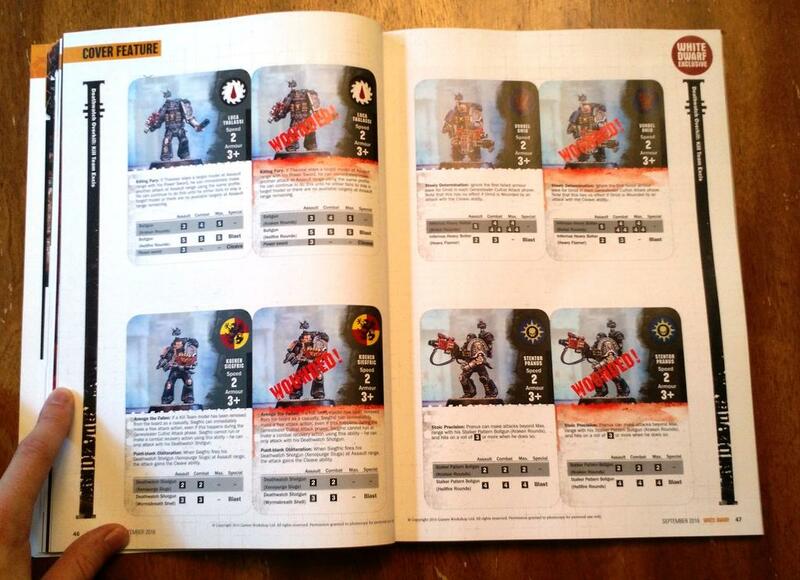 The rules are for nine different games that Games Workshop has produced over the past few years. You’ve got a new Killteam for Deathwatch: Overkill, new missions for Space Hulk, scenarios for Betrayal at Calth, a Terminator variant for Lost Patrol, rules for using Daemons in Assassinorum Execution Force, rules for the free Slaughterpriest for both Silver Tower and Gorechosen, new Gorchosen characters, a battlescroll for The White Dwarf himself, rules for the new Deathwatch fyler in Stormcloud Attack and a few more. Even if you do not own or play any or all of these games you have to admit this is massive step in the right direction for the magazine and these types of inclusions are what many readers are looking for. The next two sections, Golden Daemon and Illuminations, provide a look at the best of the hobby. Golden Daemon from the model perspective and Illuminations from an artwork perspective. Now, this is nothing new. White Dwarf has been covering the Golden Daemon competition for a long, long time. However, the key difference is that now both Golden Daemon and Illuminations include words from the artists. The winner of the Golden Daemon, Andy Wardle, is given the chance to speak about his work and painting techniques. In Illuminations each piece of artwork has a footnote from the artist describing the inspiration, background or style of the piece. We have all spent hours staring at the artwork of Warhammer but very rarely do we have a chance to hear from the artist themselves. Up next is another long standing White Dwarf feature, the Battle Report. 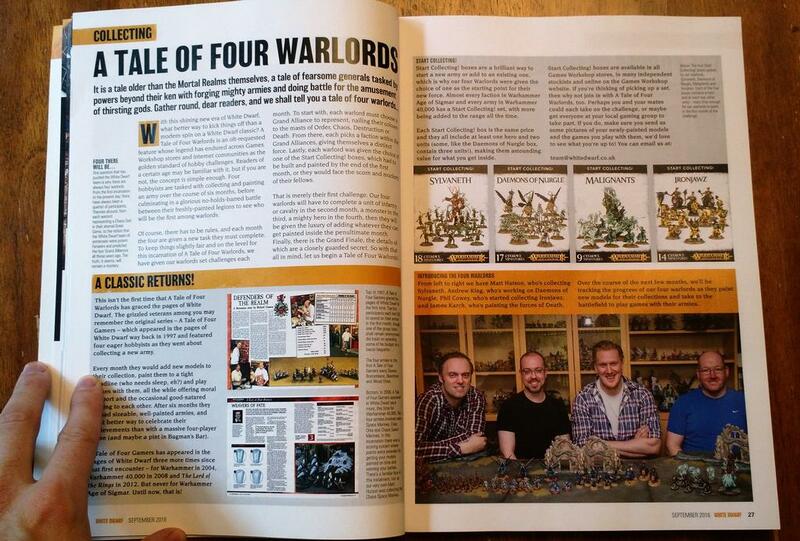 I have always felt that Battle Report should focus on more competitive and less narrative style of play and for many years, in previous editions of White Dwarf, it was exactly that. Each army list included points and every move and wound were tracked during the game. I always liked reading the Battle Report because it highlighted the game as my friends and I played it. During the Warhammer: Visions era, the Battle Report section was, frankly, a joke. There was no description of the army lists or what was actually taking place during the game. It was more a series of dramatic words with vague descriptions. 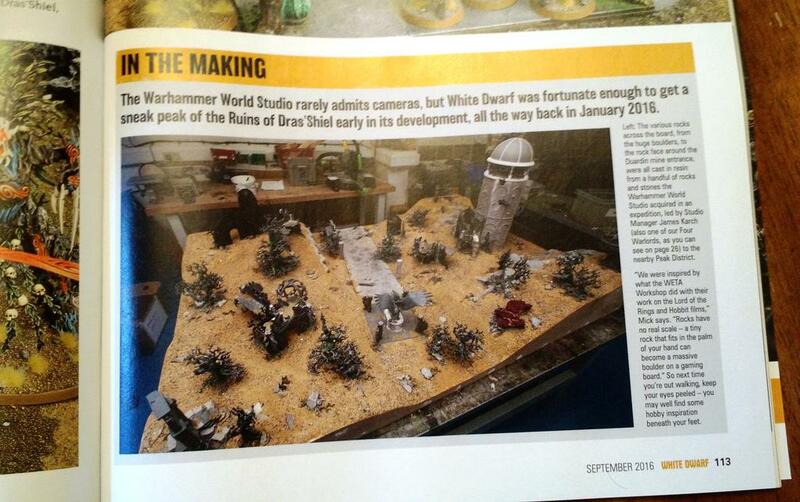 This new edition of White Dwarf straddles the line between narrative and competitive. The battle pits an army of Stormcast Eternals against a massive Khorne army. The lists used are discussed, but no points are included. Maybe the game is not using the rules for Matched Play? I’m not sure because there is no note on how this game of Age of Sigmar will be played. The coverage of the first turn is excellent. There is a large picture of the entire battlefield showing where each unit moved to and areas of interest are noted with extra detail. However, after turn two the report starts to become disjointed and hard to follow. There is a notable shift from a coverage of a competitive game to a more narrative write up. Overall this 13 page Battle Report could have been better. The coverage of the game proper started out detailed and easy to follow. But by turn three there were no more large battlefield photos and the game became hard to follow. I’ll be keeping a close eye of next months battle report. Another new feature is Battleground. This section highlights “the finest gaming tables in the world” and has great potential as a feature. There are tons of closeup detail shots of the table along with insight on both how parts of the table were created and what the thought process behind the table was. There is one thing I wish there was more of, work in progress photos. There is one In the Making photo and it is fantastic. It shows the table in it’s built but unpainted state. Show us more of this! Readers want to see what these incredible projects look like while they are being created. There is even more packed into this issue that I simply do not have room to cover. There is the Ultimate Guide To… showcasing Imperial Knights, Blanchitsu (sadly) is included, there is an entire section on Kill Teams, Paint Splatter is as amazing as always and Designers’ Notes covers the new Deathwatch models and codex. Simply put, there is a hell of a lot of content packed into this first issue of the new White Dwarf magazine. Overall I am impressed. The September issue provides new rules and options for the games we play. It provides artists and hobbyists a platform to talk about their creative process and the techniques they used to achieve the final product. I would have liked to see more work in progress pictures (I’m looking at you Battlegrounds and Designers’ Notes) and a more competitive style battle report. This issues does so many things right and is just a couple tweaks away from being a great magazine. Let this be your final takeaway; White Dwarf is talking to the hobbyists themselves and providing a platform to communicate to the Games Workshop community. That fact alone gives me hope for the future of this magazine.